Permobil New Zealand is proud to announce its recent donation of three new Permobil M1 tilt in space power wheelchairs and a range of ROHO cushions and backrests to the Auckland Spinal Rehabilitation Unit (ASRU). The ASRU is a regional spinal injury rehabilitation service which provides comprehensive care for people with a spinal cord injury from the central North Island to the Far North. ASRU is part of Counties Manukau Health and is one of two supra-regional spinal rehabilitation services in New Zealand, the other service is Burwood Spinal Unit at Burwood Hospital in Christchurch. The inpatient unit consists of 20 beds dedicated to short term spinal rehabilitation for patients aged 15 and older who have sustained neurological deficits from a spinal cord injury due to trauma/injury or illness. The Permobil new M1 mid-wheel drive power chair offers a new solution designed to adapt to consumers' unique seating and positioning needs. Featuring an open, rigid tubular backpost design the M1 accommodates virtually any seating system from a simple curved backrest, to ROHO® AGILITY® Back Systems and custom molds with minimal loss of seat depth. 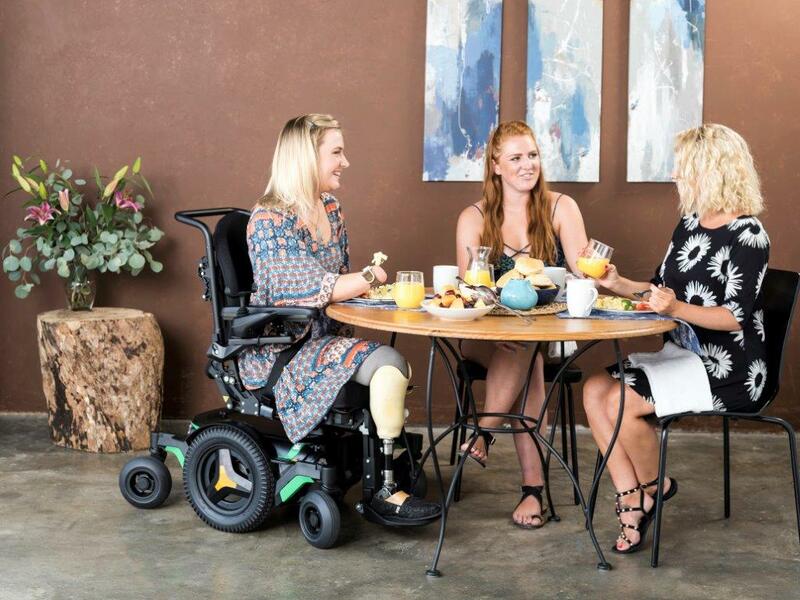 In addition to flexible seating configurations the M1 has adapted the latest Permobil technology including proven and reliable drive motors, sleek design and FlexLink technology. FlexLink suspension absorbs vibrations so consumers can feel more secure and maintain better positioning regardless of the terrain. The 1" rigid, tubular backrest design allows consumers to customize their Permobil with virtually any seating solution. Now, consumers can easily select and add on required seating options including curved, solid backrests, ROHO AGILITY and custom seating with minimal loss of seat depth. UniTrack rails allow for easy mounting of accessories and electronics. Locking, flip back armrests with two points of contact built to withstand a consumer's active lifestyle and avoid loosening over time. The durable center mount legrest assembly was adapted from Permobil's Corpus seating system while the soon to be released multi-position swing-away legrests facilitate lower extremity positioning and swing out 135° for transfers. Built from the same chassis as the market leading M and F series models, the M1 features proven drive units and consistent service methods to promote reliability for the consumer. The patent pending FlexLink's unique suspension geometry and linear spring design provides advanced vibration reduction for a smooth ride over various terrains. 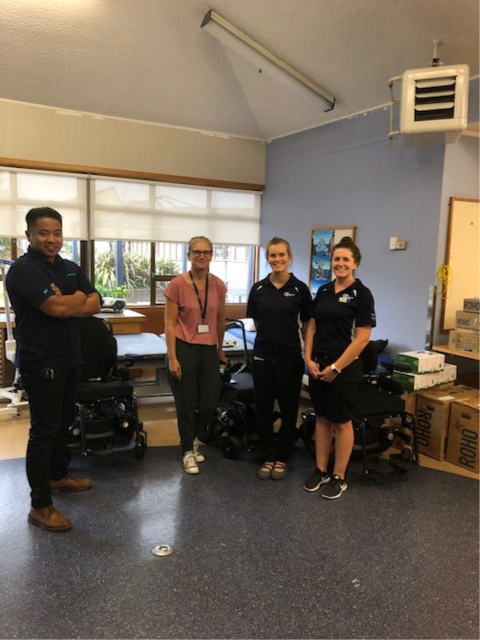 The Power Wheelchairs were greatly received by Katrina Spence, Team Leader In Patients along with Katie Strachan and Megan Marshall. Katrina mentioned….”the wheelchairs would be put to immediate use”. In conjunction with the wheelchairs, Permobil NZ also donated six ROHO Agility Backrests of varying sizes and six ROHO cushions to fill the gaps missing as part of the existing fleet to ROHO products in use at the ASRU.